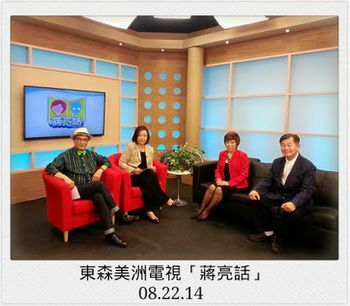 Our Principal Wedding Consultant, Sherrien Shui was invited to speak at Channel 62.6 ETTV America's talk show - MD Talk （蔣亮話）about the culture of red envelop (wedding gift). If you received a wedding invitation from a Chinese-American friend, you might find no bridal registry coming with it because it's too embarrassing to ask people for gifts in Chinese culture. What should you bring to the wedding, then? That's easy—just cash, a check or a gift card that you know the couple can definitely use, like a Target or Walmart card. The monetary amount in the red envelope should be equivalent to a nice gift that would be given at a Western wedding. It should be enough money to cover the guest’s expense at the wedding. For example, if the wedding dinner costs the newlyweds US$100 per person, then the money in the envelope should be at least US$100. The Chinese custom of money giving is meant to help the couple pay for the wedding. If you agree with the concept and want to be totally culturally appropriate, put the money or gift card in a red envelope. For all occasions, certain amounts of money are to be avoided. Anything with a four is best avoided because four （四） sounds similar to death （死）. For weddings, even numbers, except four, are better than odd. Eight is a particularly auspicious number. Nine means longevity and everlasting. The money inside a red envelope should always be new and crisp. Folding the money or giving dirty even wrinkled bills is in bad taste. Coins and checks are avoided. If you don't read Chinese, however, make sure you pick a red envelope with no Chinese characters on it, because most of the red envelopes with Chinese characters are used to give money during Chinese New Year or for birthdays. You can write your best wishes for the couple on the plain red envelope and use that in lieu of a wedding card. For weddings, a short message, typically a four character expression, and signature are optional. Some four character expressions appropriate for a wedding red envelope like 天作之合 (marriage made in heaven), 早生貴子 (may you soon to have children) or 百年好合 (happy union for one hundred years) are appropriate. Feel free to contact us if you have any questions regarding different cultures and wedding traditions.